Creatives probably have the most liberating offices. Have you ever been to the artist working space? Today we joined artist Ekaterina Chernova in her art studio. No this is not a room, this is a place, somewhere outdoors where you will find artist Ekaterina Chernova working on her new painting. � I like painting on location, somewhere in the field or by the water� - says artist Ekaterina Chernova. 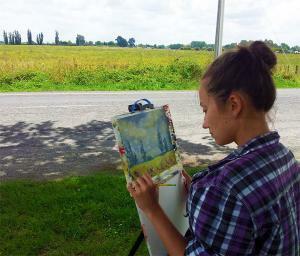 Ekaterina chose plein air or simply painting outside to learn more about natural light and colors. This approach to painting has been around since the old days and is now getting popular amongst contemporary painters. Artists Ekaterina Chernova is convinced that no camera can teach the artist about true depth and color in landscape scene. Artist Ekaterina Chernova admits that while working in the art studio with other artists can be beneficial, it also creates distraction when other people are around. �In the field, there is nothing else to do, so you might also finally stand and paint there. It also takes a lot of effort to bring all equipment to that location and set it up. After you drew for miles or spend an hour walking in search of the view, there is no way back without a trophy.� - laughs Ekaterina Chernova. As the weather changes fast and the lighting moves every couple of hours, artist Ekaterina Chernova paints field studies very fast,often completing a painting within one go. Later in her home studio Ekaterina turns them into bigger pieces if needed. �Most of the time people just want a small painting created on location, because they feel there is something special about it� - admits artist Ekaterina Chernova. Ekaterina travels with her backpack of oil color, palette, and folding easel. �My studio is basically in my bag. Sometimes I dont even use my easel� - says artist Ekaterina Chernova. �It also gives me more freedom through the limit of choice, I can only take so much with me. This is very liberating for me as an artist� - admits Ekaterina Chernova. You can see artist Ekaterina Chernova painting in a small town in New Zealand. She also paints at the local art society rooms and in her cozy home studio. However she prefers to call outdoors her studio when possible.